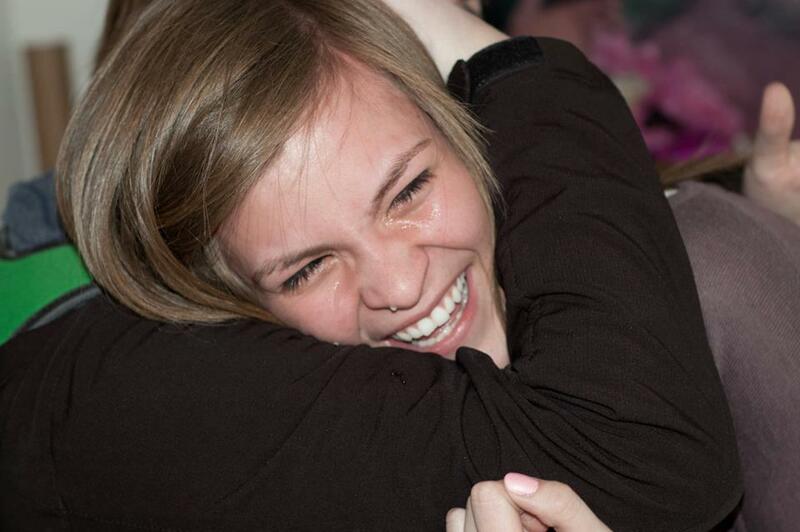 Amanda Joy, newly engaged, embraces her fiancé at a Valentine’s Day dinner inside the Cavalryman shortly after he proposed. After working a very stressful Valentine’s Day dinner at a local steakhouse this moment brightened not only the night for this couple, but for several of the servers I work with. While it may seem like a very simple photograph to capture it was extremely difficult for how intimate this moment was. At first, I felt like I was intruding by photographing this event; however, I soon realized that while this was a very personal time, this was still a time of happiness. I wanted to capture the extremity of Amanda’s emotions with her tears, but also the joy in the smile spread across her face. I figured since this is a very personal moment it would be best captured up close to draw attention to her emotions. I also used focus to draw direct attention to her face with no background distractions. 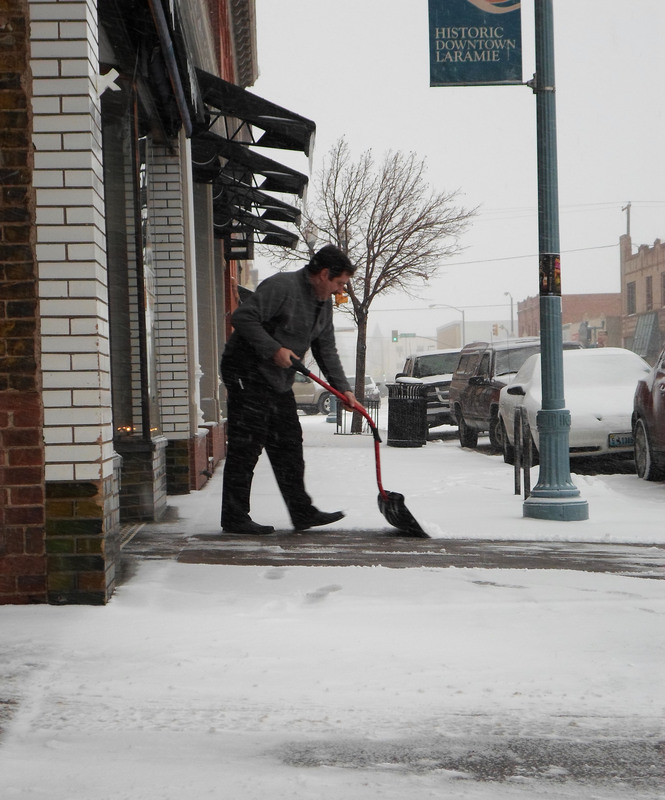 Michael Brass clears the walkway out front of his business, Mountain Pacific Mortgage as the snow continues to fall on a quiet and gloomy Tuesday afternoon in Laramie. An unexpected snowfall hit the city of Laramie on the early morning of February 26th. As homeowners spent most of their day shoveling driveways and their front sidewalks, business owners didn’t hesitate to do the same thing. I didn’t think to capture this photograph until the man hollered at me to “stay warm!”. Then I realized the effect the snow had on him and his business. He was doing his civic duty to keep customers and townspeople safe from sliding out front his business. It was very easy to get this shot because of his friendliness and because I photgraphed a lot of this scene. When photographing this subject I felt like I was capturing an everyday moment in Laramie where snow is a normal occurance. Some of the creative devices I used were leading lines, with the shop windows and canopy’s that lead out of the photograph just above the subject, and the rule of thirds so that the man falls right along the points of intersection, capturing the eye of the viewer. 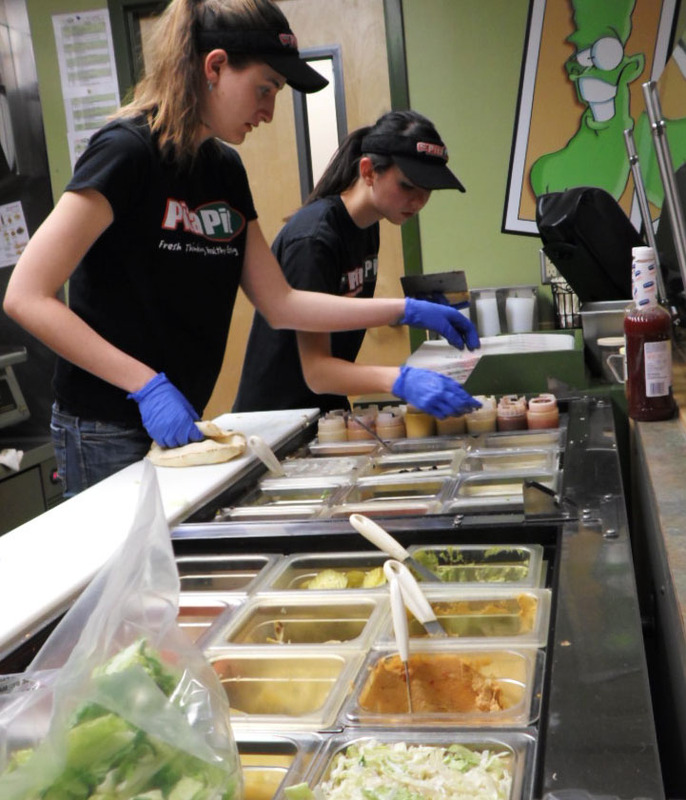 Employee’s Laura Angell and Marlena Saxe, use team work to take on a busy lunch shift at Pita Pit in the Wyoming Student Union. Every day the Wyoming Union fills with students eager to keep warm or grab a bite to eat. On a lunch break I was able to capture several of the employees hard at work as the snow drew students inside. When I began photographing it was somewhat awkward. I wanted to get behind the glass so that my photograph would capture their hands at work. Here I used leading lines from the linear food station that draw the focus of the image straight towards the employee’s hands. 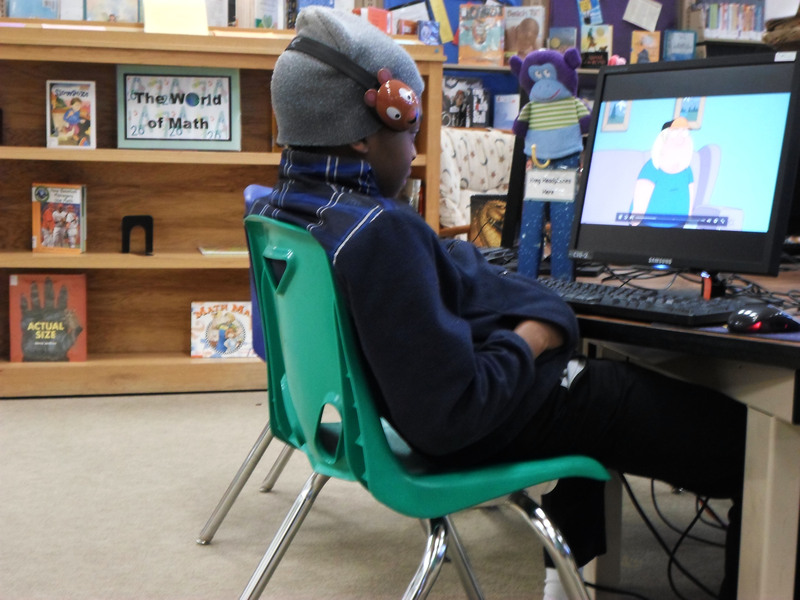 Third grader Marcus Grave uses the computer at the Albany County Public Library for a little Family Guy entertainment after school. After school hours at the Albany County Public Library invite several young students to come study, read books, research online, or find entertainment sources. This picture was difficult to take becuase I didn’t want him to know I was taking his picture; when some kids realize they are being photographed they like to pose for the camera. Instead I quietly spoke to his mother who gave me permission to take the photo and then waited for a shot. After browsing on the computers, Marcus began watching ‘Family Guy’ which I found very humorous for a childs library entertainment. I used the direction of his eyes on the screen to draw the viewer to the computer screen. I also like the color used for the bright green chair on his dark colored clothing. Focus was also used as the books are blurred in the background. I also used rule of thirds for the boy. Laramie Plainsmen endure a tough practice after coming out of a losing game to Cheyenne East. Head coach Chuck Kern put his boys to work during a team scrimmage. After attending both the Plainsmen and Lady Plainsmen basketball practices at the local high school I was able to score this action shot. 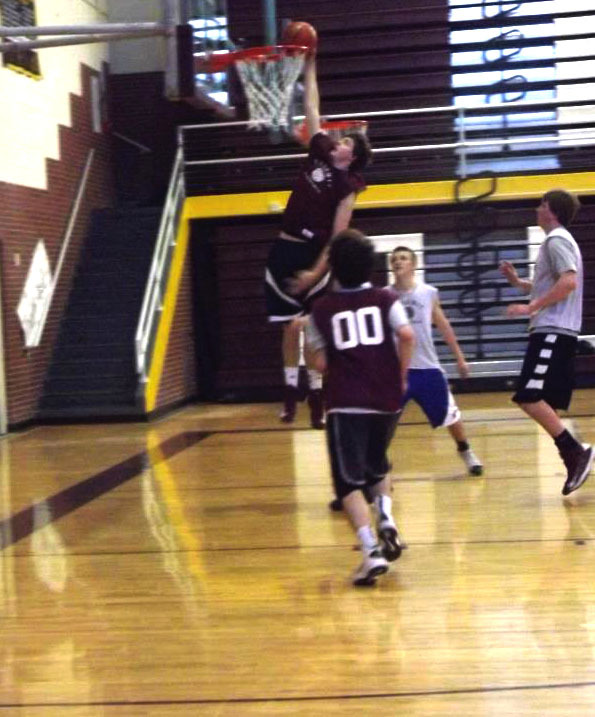 The boys’ team was coming off of a game loss to Cheyenne East and was paying for it in this practice. Everyone was exhausted and even I was struggling to get a good photograph. After moving around on the court and standing high up in the bleachers I was able to capture this layup from the floor. It was difficult to get a good close up picture with a basic camera, but when I got this shot I knew I was leaving with just what I was looking for. In this photo I used focus; all of the boys direct their eyes towards the ball at the top of the basketball hoop which immediately draws their attention to the subject. From this assignment I learned that photography can do more than just capture a moment; it can tell a story. While I was surprised of how difficult it was to capture a clear action photograph on a basic camera, it did make me wish I had a more complex one. I also feel like I took a variety of pictures but wish I could have taken more sports photograph’s considering I want to become a sports journalist. Although I am aspiring to be a sports journalist who uses words to captivate my audience, I understand a picture can tell the same story. From family and friends, to teammates in and out of the pool, I have experience capturing memories with a camera. With that said, I could not wait to begin experimenting with the creative devices of photography. 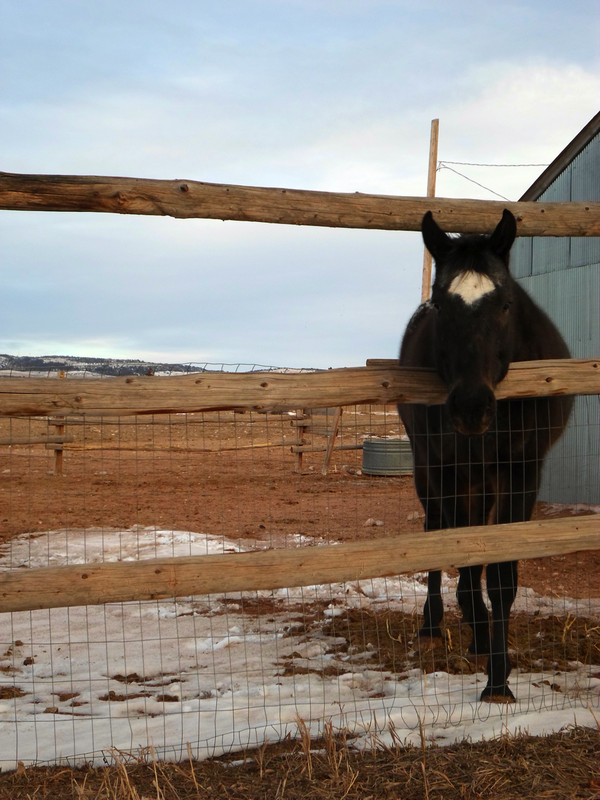 After a visit to Colorado, I was able to capture photos not only from Laramie but from home. The hard part was choosing only five to share. “Never Tame a Wild Heart” Just south of town a family friends private ranch is home to not only this horse, but several others. Intrigued, Ellie peers through the fence of her home to welcome visitors. “Never Tame a Wild Heart”– To capture this powerful photograph of Ellie I used the the rule of thirds. By placing the main subject on the lines of intersection, my photo has become balanced and more natural for the viewer to interact with. This forces the attention of the viewer to the horse’s face where the real emotion of the photograph lies. Here the horse’s fierceness and bold gaze keeps the viewer engaged. Had Ellie been in the center of the frame with a straight on look it would have made for an awkward shot. The rule of thirds rather gives context to Ellie’s home with her enclosed fencing and mountains in the distance. This picture also includes elements of contrast with the white snow beneath the dark brown hooves. The white patch above her eyes also focuses the viewer on the intensity of the horse’s face. 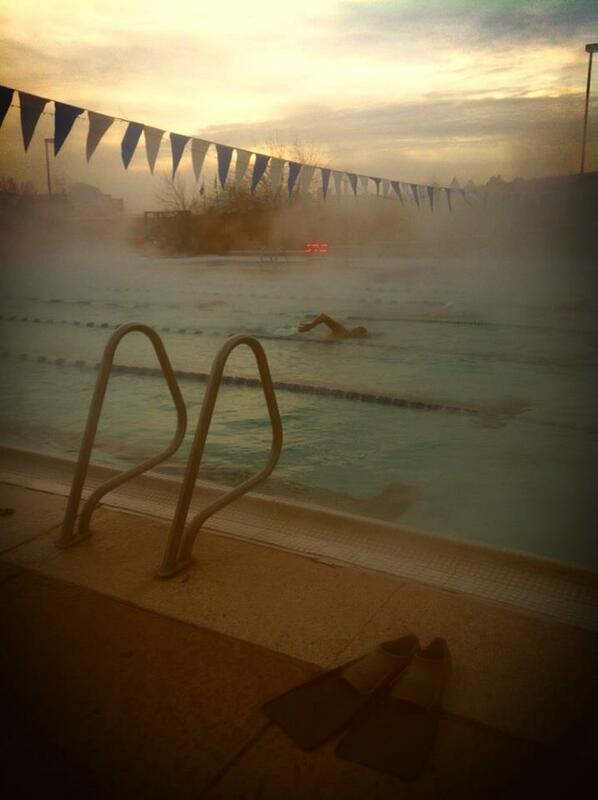 Former teammate, Connor Hartman, completes an early morning outdoor swim just as the sun begins to rise. “Mile High Steam”– During my visit I was able to capture a mid February morning workout on my phone. It illuminates both the winter weather and cloudy sunrise that engulf the swimmer. The use of leading lines directs the flow of the image. Both the directional lines of the ladder and the flags direct the viewer to the subject: the swimmer. From there, the lane lines not only serve as leading lines towards the direction of the swimmer, but also frame the athlete. This image also presents elements of contrast with the bright sunrise to the darkness of the pavement. “Wired” As the sun glares off of the snow covered ground, it brings light to a barbed wire fence that was once used to enclose private property. “Wired”– As snow still covers most of the ground in Colorado, I shot this picture to demonstrate contrast. 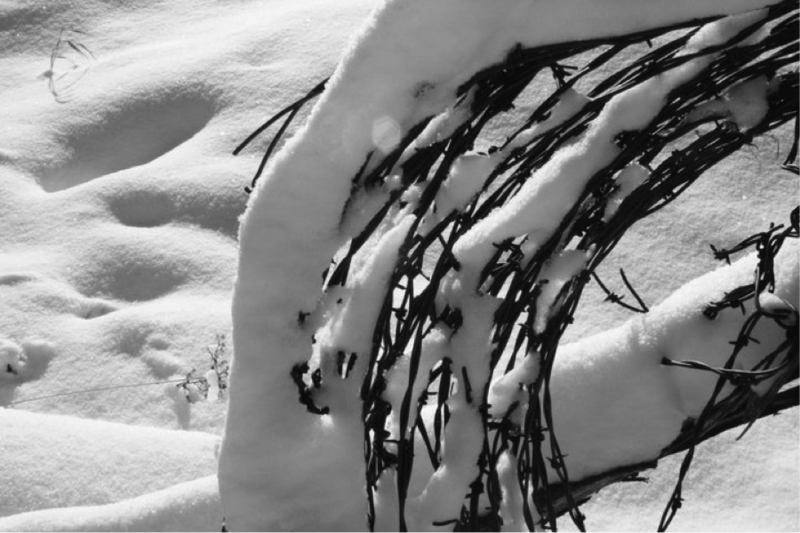 Without having to use a black and white color feature, the blanket of snow naturally contrasts the black barbed wire of an old and rustic fence. Although the glare of the sun makes the snow appear much lighter, it helps to focus the viewer on the fence. Furthermore, cropping helps to eliminate background distractions. 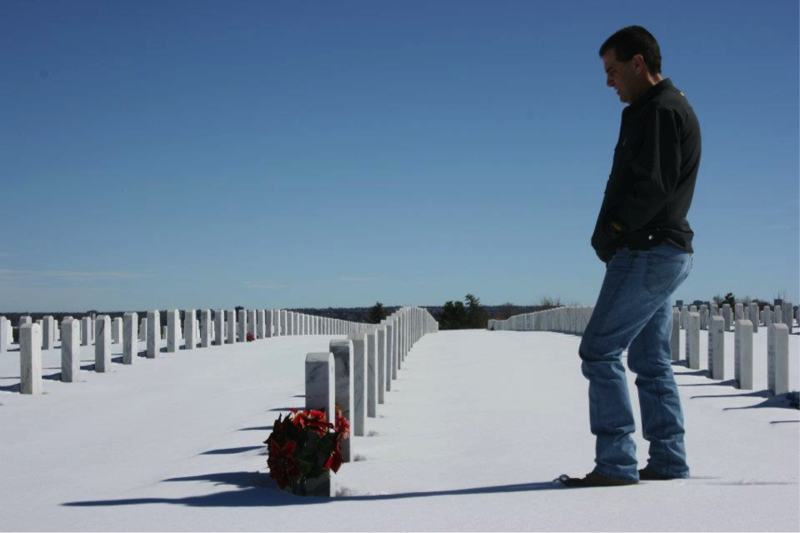 “Lonely Grieving” A man grieves over the grave of a loved one at Fort Logan Cemetery; the resting place for thousands of veterans. “Lonely Grieving”– After visiting Fort Logan Cemetery in Denver, Colorado I was lucky enough to capture a photo of a grieving man in untouched snow. The creative device captured in this photo is symmetry and patterns. All of the headstones are strategically placed in rows, creating a sense of order for the image. The evenly spaced graves create a symmetrical pattern across the cemetery. The organization created from the symmetry and patterns draw the viewer to the subject, focusing on his grieving emotions. The lack of footprints in the snow also creates a smooth texture which eliminates distractions from the subject. 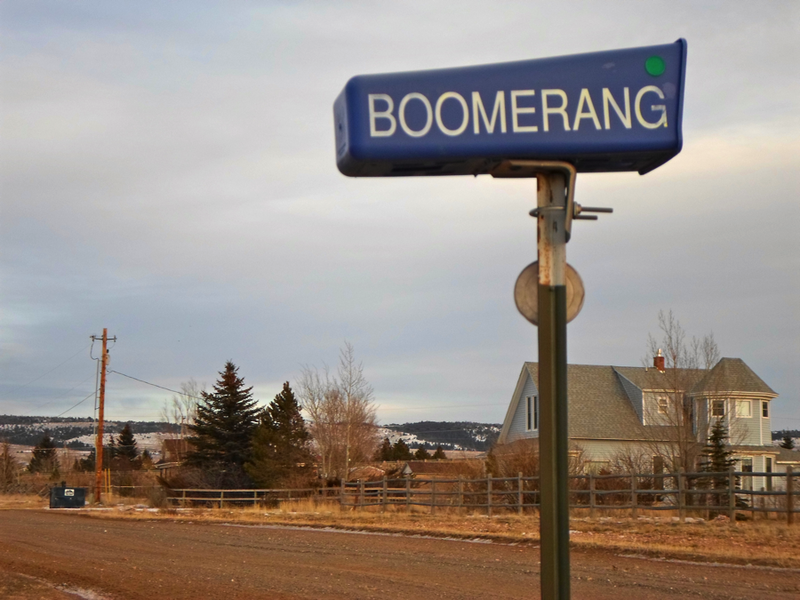 “Supporting the Boomerang” A Laramie home just outside of town supports their local newspaper with a box for their weekly delivery. “Supporting the Boomerang“– The device captured in this image is establishing size, where the angle of the photo makes the box appear much larger than it is in reality. 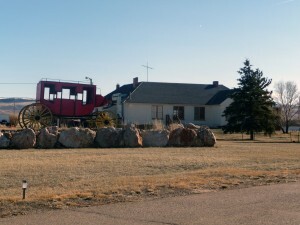 The house in the background gives viewers a perspective of the actual size of the Boomerang box. Although the viewer understands that a house is larger than a mailbox, establishing size helps to strengthen the focus of the subject. The overpowering size of the box helps to isolate it from any background distractions. The viewer also understands that the mailbox is not tall enough to reach the sky, however, this perspective of size makes it far more interesting than if it was captured in its actual size. The mailbox also incorporates color with the lack of background color involved. After completing this assignment and analyzing my own photographs, I learned that there is much more to a photograph than just shooting the camera. By experimenting with these creative devices, I have learned that it sometimes takes multiple elements to turn an ordinary image into something powerful. What surprised me about this assignment was how difficult it actually was to capture an image in a creative way. Even though I took a little over a hundred photos, the one thing I would have changed would have been to take more. While I had several photos of different subjects, I would have had more variety if the same subject were shot in different lights, angles, and environments. The more you have to chose from the better. “Cheers to a New Year and another chance for us to get it right” says Oprah Winfrey, as the ball dropped for the start of 2013. And that’s just what Laramie, Wyoming did. With only 31,000 people which includes the population of the University of Wyoming, the small close-knit community of Laramie prides itself on locally owned restaurants. Although, being disadvantaged by it’s population size, Laramie’s restaurants must continually change in order to stay competitive and successful in such a small town. Well known for their fine Italian cuisine and classy dining, Luciano’s has made a bold step in the direction for change. In fact, if you were to drive by today, Luciano’s no longer exists. Luciano’s is currently in the process of relocating to the previous establishment of what was most famously known as Wingers. This advertisement for Born in a Barn is now being displayed in the Luciano’s window. The new location of Luciano’s will make it the first restaurant people see as they drive into Laramie from the I-80 exit. Owner Eileen Obsuth said the new location on Grand would allow Luciano’s to expand their seating from about 60 at their current location on Ivinson, to about 140, as well as double the current number of employees from 22 to 44. This, in turn, will generate far better profit for the restaurant and bring awareness to a new establishment. 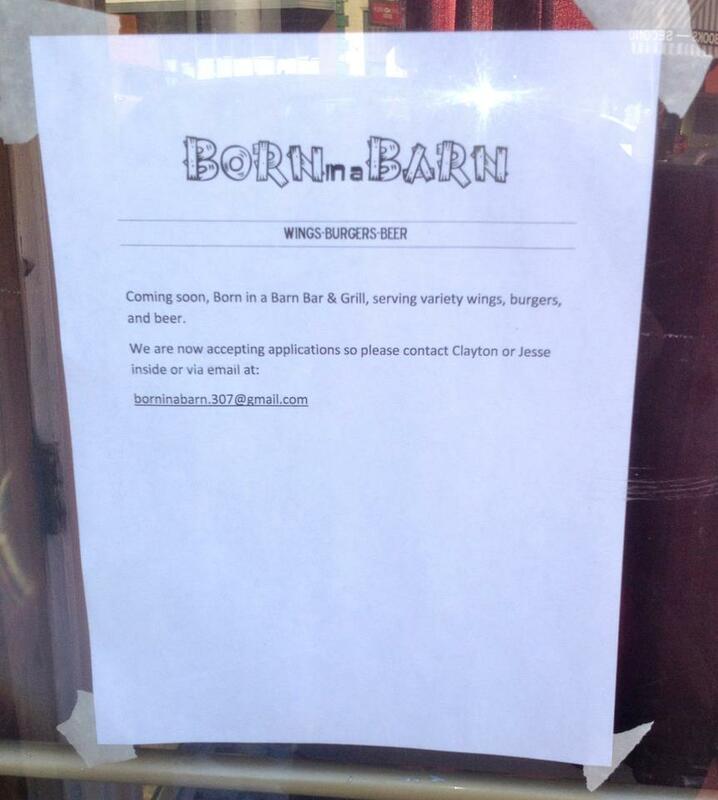 The previous location of Luciano’s will be the new home of Born in a Barn, a burger, wings and beer joint. Do You Still “Tell Your Mom You’re at The Library”? As the Library Sports Grille and Brewery said there final goodbye’s on January 26th, also their 5-year anniversary, there has been plenty of chatter of what’s in store for their restaurant. Famous for their prime location, just walking distance from both campus and War Memorial Stadium, The Library was extremely successful. 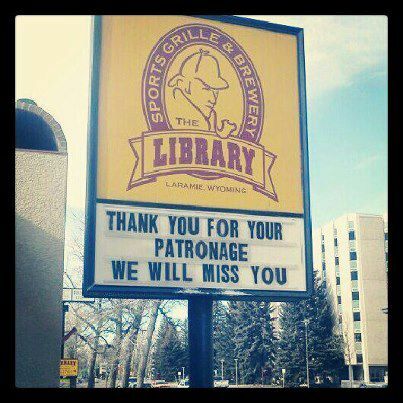 As the owners of the restaurant and owners of the building parted ways after disagreeing on lease negotiations, The Library is saddened to leave their home but will bring their valued customers wherever they go. While this may be a rough time for the community and employers of The Library, this is also a time neighboring restaurants will take advantage of such a loss. Just down the street is Bailey’s Restaurant and Patio, which is hopeful for more business on game day now that The Library has moved. Sannes also said they are expecting to see a drastic increase in customers not only on basketball and football games, but professional game days as well. New additions to the Cavalryman Steakhouse invite customers in. While the Cavalryman steakhouse has always been a specialty restaurant to the Laramie community, owner John Pope is hoping that their new management might bring back popularity. After multiple changes in management from 2005 to 2012, the Cavalryman has struggled to keep a steady crowd. However, a new chief and new management has been the solution for their most recent success. The menu has been updated to accommodate more Wyoming traditional dinners and seafood entrees. They are also in the process of reducing the prices in the menu and reaching out to the average, college student population. Owners are excited to see how recent changes will affect their sales costs and bring back the excitement for one of Laramie’s most historical restaurants. 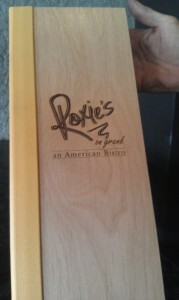 With all the adjustments in Laramie’s restaurants, Roxie’s on Grand serves as a superior example for the success that comes with change. For years the corner of 3rd and Grand was well known for Tommy Jacks and their famous Cajun cuisine. As Tommy Jacks began to struggle with retaining steady business, the location needed an update. The community has become excited to go out to eat again and their servers can’t complain about a busy night full of tips. If this town continues to do what it has always done, it will see no results. This change gives a sense of hope to other restaurant owners and entrepreneurs that, while Laramie may be a small town, they can succeed if they keep a steady rate of change.